The competition was to produce a design suitable for Nia to use on her Christmas cards, with prizes for the winning pupils and their schools. The originals of the winning pictures have been framed for the pupils to keep. 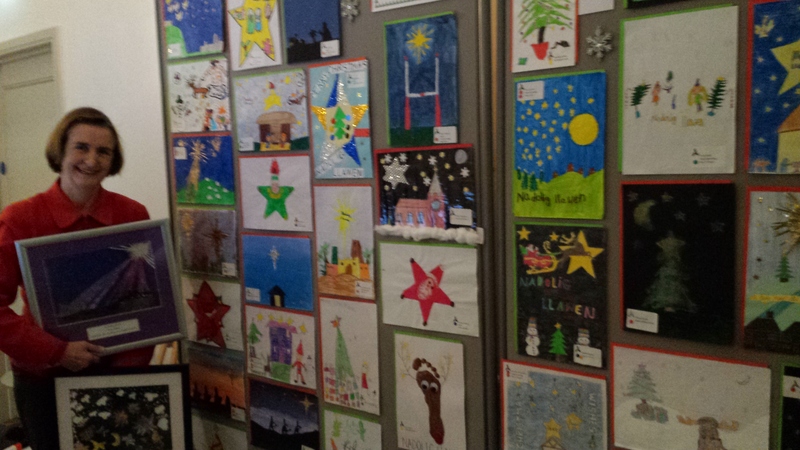 The competition was open to local primary schools and attracted over a thousand entries. The theme for this year’s competition was Big Ben at Christmas. The runners up in the Junior category were Georgia Evans of Ysgol y Castell, Carys Lloyd of Ysgol Gymraeg Dewi Sant, Dominic Crosswell of Ysgol Parc y Tywyn and Helena Davies from Ysgol Trimsaran, and in the Infant category the runners-up were Susanna Cunningham of Swiss Valley School, Gwenno Owen of Ysgol Gymraeg Dewi Sant and Eleny Leighton of Ysgol y Castell. As well as the winners and runners-up, entries that were placed in the merit, commended, highly commended and very highly commended categories are on display from 5th December until Christmas in Llanelly House, Bridge Street (opposite the Parish Church), Llanelli. The Christmas card display is on the ground floor where there is no charge for admittance.